Baduk, the Korean Game of Weiqi, or Go. Like many people, the first time I ever heard people talk about this ancient game they called it Go and said it was Japanese, but that’s not quite true. Japan has had a huge influence on the game, but they did not invent it. According to creditable historians, archaeologists, and researchers it originated in China sometime before the 4th century BCE when we have the first written record, in Zuo Zhuan, of the game. Some place its’ origin at a much earlier date, and that might be so, but without extant boards, paintings, or written records from before then an earlier date is hard to prove. Legends place it much earlier, as much as 5,500 years ago. The game was also not called Go, but Qi,(or Yi) and later Weiqi. The Confucian Analects from the 4th century BCE also mentions Qi, but in the general sense of ‘game’ so maybe not specifically Weiqi as other games were played in China at this time. Nevertheless I think it fair to say that sometime before, or around, 2,500 years ago the upper classes in China were playing Weiqi. 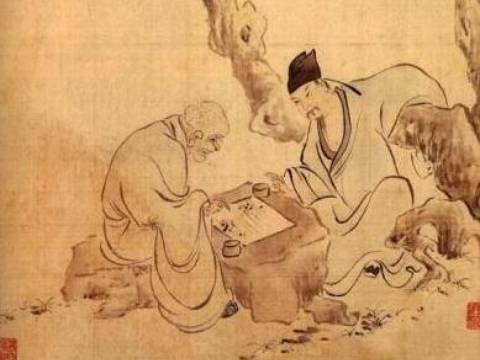 It was one of the four attributes of a scholarly gentleman, to be a master of music, Weiqi, calligraphy and painting. Baduk is the name given to Weiqi in Korea. It is not known exactly when the game reached Korea from China, but it was probably sometime around the 5th century AD, although considering the long relationships between China and her neighboring states it may well have been earlier. In the retrospective history book Samguk Sagi written and compiled in 1142-5 AD from earlier more ancient texts such as Sima Qian, Wei Shu, Sanguo Zhi, Jui Tangshu and others, a story about Weiqi is recounted as having taken place in AD 475. In it a renowned Baduk player, who was secretly a spy, was sent to the court of the Baekja King to try and influence him into making poor decisions leading to the eventual weakening of his kingdom to the extent that Goguryeo King Jang Su was able to defeat him and take his kingdom. The Samguk Sagi recounts several other stories were Baduk/Weiqi is mentioned. The Samguk Sagi was written in classical Chinese, the language of the literate elite of the time so I’m not sure if it was specifically called Baduk at that time, or was still known as Weiqi. 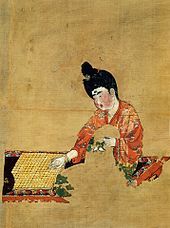 Chinese sources such as Sindang-seo Xin Tang Shu and Huo Zhou Shu also attest to the fact that Baduk/Weiqi was played during the Three Kingdoms period (57 BCE -AD 688) of Korean history. It continued to grow as a game and a life skill for the ‘yangban’, the ranked civil and military upper class elite, and was soon seen in Korea as being necessary for those seeking advancement. 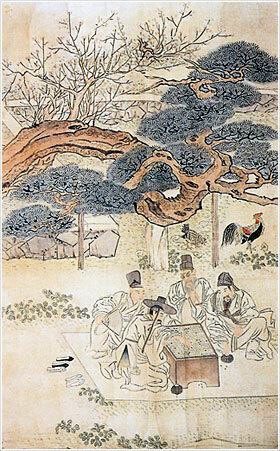 Scholars incorporated references and analogies to Baduk in their poems and literary notes while wealthy families hired teachers to ensure that their sons received adequate instruction in the four gentlemanly arts. A good Baduk player was always welcome in any social situation. Many kings, princes, senior ministers, generals and scholars were known to have played, as well as some kisaeng and courtesans. The early forms of Weiqi/Baduk often were played on a 17 x 17 grid and it took some time before the 19 x 19 board became the standard size. The board on the left is from China and dated to AD 182, while the board on the right is dated from the mid 7th century AD and was a gift from Baekja King Uija to a Minister in Japan. It is the oldest wooden Weiqi/Baduk/Go board in existence. Japan was the last of the ‘big three’ to learn of the game, probably in the 7th century AD. There are many good articles on Go in Japan if you are interested in learning more about its’ spread and explosive growth there. 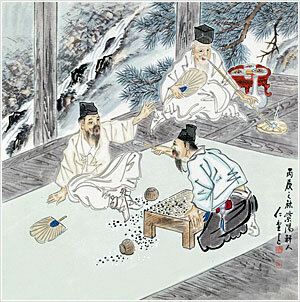 Sometime during the 16th century Baduk in Korea changed from the Baduk/Weiqi traditional method of play and a form called Sunjang Baduk became popular. In this form the first 16 moves were already determined, a bit like in a game like Chess where the pieces are already on the board and you start play from that setup. (A lot of very old games didn’t start with pieces already set up on the board as the process of where you placed your first pieces was important to how the rest of the game was played. Nine Men’s Morris is a good example of this, as obviously is Weiqi.) Sunjang Baduk was also scored differently and the whole game was said to produce more aggressive, but at the same time more pragmatic players. The traditional/international method of play returned to Korea in the late 19th century with the Japanese occupation of Korea. Both methods of play existed for a while, until gradually the Japanese method became the most popular with ‘modern’ Baduk finally taking over in the late 1940’s with the founding of privately organized associations such as the Hansung Kiwon. In 1955 the Korean Baduk Association was formed and official tournaments soon followed. The next few decades saw the public acceptance of the ‘new’ Baduk and the number of players began to increase, as did the quality of those players. Some players went to Japan and brought their new knowledge back with them. By the late 1980’s/early 1990’s Korea was beginning to challenge on the world stage. By 1996 it was acknowledged that Korea had some of the best players in the world as they dominated many competitions and international tournaments. Many of the top players are professionals and make their living by playing in such competitions and tournaments, but with the success of the professional players there has also been an increase in quality amateur players as well. Korea still has some of the best players in the world, but China has seen an increase in good younger players lately and are regularly producing tournament winning players. Sadly Japan is falling behind these two powerhouses of the game. There are multiple sites online on how to play Weiqi/Baduk/Go and it is one of those games that ‘is easy to learn, but hard to master.’ Although Chess players will no doubt disagree, mathematicians and game players alike say that Weiqi/Baduk/Go is the more stylish and complex game to truly master. It has been likened to a long duel played in the form of a game. You may also enjoy Alkkagi, Yut, and Omok. Please do not copy or use without permission and accreditation. Photo credits to original owners. Category: Games, History, KPOP, Odds and Ends. ← Korea Without The Chili Pepper!